1. Trends don’t necessarily start on the coasts. Cambridge is home to the casual-yet-excellent Georgetown Vineyards, set on top of a ridge overlooking the city. You can sit out on the deck, eat a brick-oven pizza with your glass of choice, and look onto the vineyards or down to the beautiful, historic courthouse building. There’s live music many nights, and they’re kid and pet-friendly, too. Not a bad afternoon, any way you slice it. It’d be easy to think that Cambridge just jumped on the winery bandwagon, but Georgetown has been around since 1999 (that’s a voting adult!). They’ve had nearly two decades to establish their vines and perfect their wines, and it’ll take at least an afternoon lounging in one of their Adirondack chairs to sample the list. Bonus: Their partnering with Southside Brewing Company means Georgetown is now a combo winery + microbrewery…how many of those have you been to? 2. Torpedo sauce is what your life has been missing. I found more gourmet food at one store in Cambridge than I have in entire cities. 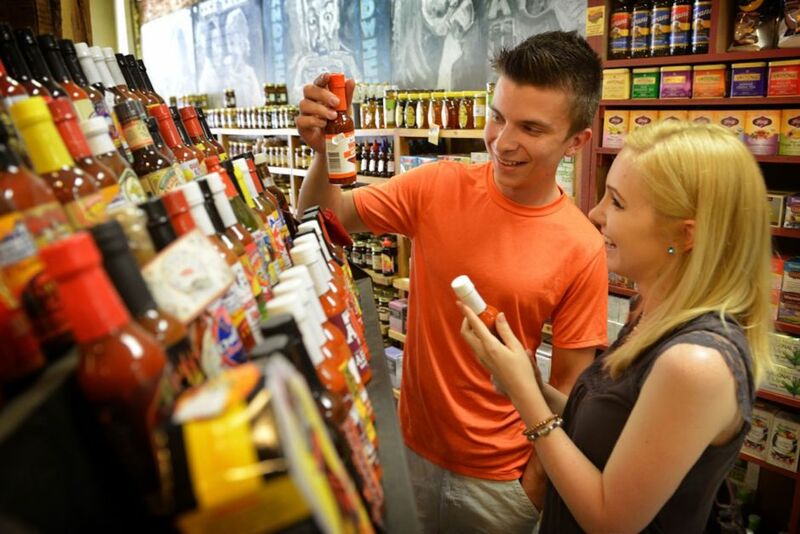 McKenna’s Market sells Amish fry pies, sugar plum syrup, vintage pop, farm-fresh meats and cheeses, and about 30 different hot sauces. It’s like walking into Amish country in the city — and everyone knows the Amish do everything better. They do full-on meals, too. The McKenna’s Favorite sub is the best, but you have to try it with their secret torpedo sauce. If you still have some breathing room after wolfing down one of those, perk up your afternoon with a cappuccino from Ladders Coffee Bar. For a fancy dinner, check out the Bear’s Den Steakhouse. Eventually, at least. Maybe not right after lunch. 3. More hiking is always better than less pie. For a population of around 11,000, this little town has more than its share of green space. It’s home to miles of bike paths, hiking trails, lakes, and rivers. So spring for dessert. Go to Theo’s Restaurant, and go unabashedly for a slice of homemade mile-high lemon meringue pie. Heck, take pie to go. Take pie for the hike. It’s allowed. But back to Cambridge — even the town park is no ordinary place. Cambridge City Park is a rambling expanse of playgrounds, trails, a baseball field, a pool, basketball courts, and even an ice cream stand. All this isn’t even addressing Salt Fork State Park, the state’s biggest. But let’s save that for later. 4. Time travel is possible…at least around Christmastime. Every November and December, Wheeling Avenue transforms into a Dickens-themed Christmas village. Life-size displays, handmade by local Cambridge artists, depict nearly 100 different scenes that make for a great walking tour. You’ll see tableaus from A Christmas Carol and re-creations of other Victorian-era activities, including a firefighting bucket brigade. 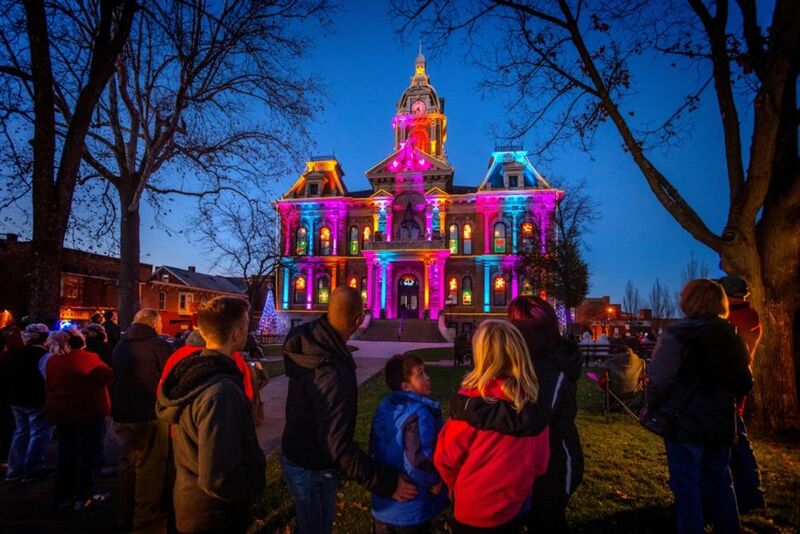 Bonus: Be sure to stick around for the Courthouse Holiday Light Show — it happens 5:30-9pm every night from November 1 to January 1. The ornate building gets bathed in 55,000 lights, not to mention the animated displays and two-story Christmas trees. It’s basically a surefire way to get in the holiday spirit. 5. Security cats are a real thing. Nope, not an acronym for some kind of Segway/ATV hybrid. Penny Court Antique Mall has an impressive security officer — a cat named Turtle who will sneak-attack you with cuddles and guard you by plunking herself down in your lap. If you have the heart to break your attention away from her, you’ll find that Penny Court is a labyrinth of unique old furniture, books, and Cambridge’s signature glassware. You may sometimes find a band playing in the back of the shop, too, welcoming you to sit down for a while. Cat in lap, of course. 6. 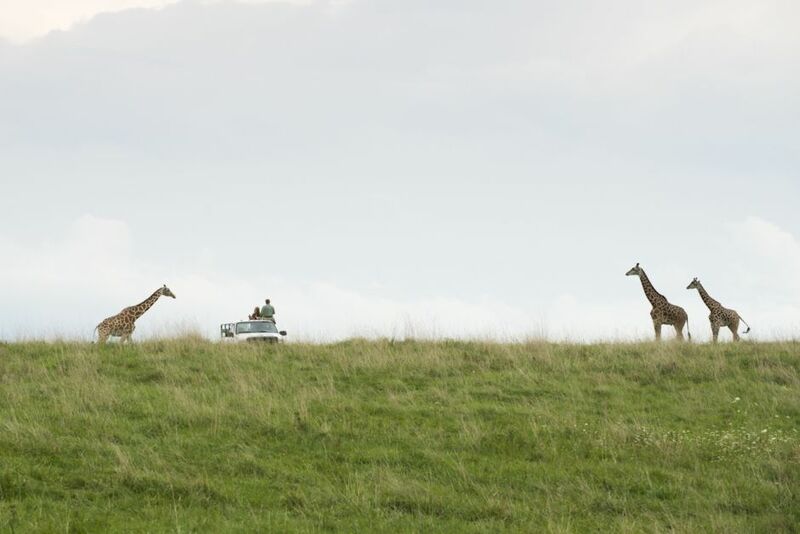 You may go on a safari in two places: southern Africa, and the middle of Ohio. Cambridge is just next door to the Wilds, one of the largest wildlife conservation areas in all of North America. This safari park and conservation center is housed on nearly 10,000 acres of reclaimed coal mine land, where visitors can zipline, ride horses, and dart between butterflies in the butterfly habitat. This is not a zoo — this is something all its own, where every habitat is in the open air, but you’re more likely to see a cheetah than a goat. If you’re over 21, you can spend the night in a yurt at Nomad Ridge, an exclusive, adults-only part of the Wilds. Each yurt has a big deck overlooking the adjacent meadows, so you can sit out there in the evening and watch rhinos wandering by. Can you do that in NYC? Didn’t think so. 7. Megafauna make cool pets. Deerassic Park Education Center is home to the Megaloceros, an “Irish Elk” that went the way of the dodo over 10,000 years ago. You can check out a replica at the park after you’re done practicing your archery — or, rather, your archery tag skills. Think of it as dodgeball, but with bows and (foam-tipped) arrows. Pro tip: Stop by on the last Wednesday of each month for Wild Wednesday and catch an expert talk on the glories of the great outdoors. I learned that shed hunting is not a hunter sleeping in a portable shed, as I imagined; it’s searching the woods for the antlers shed by deer every spring, which people use for chandeliers and other decorations. Who knew? 8. Life is better in shades of green and blue. Some may argue that the Salt Fork State Park golf course, rated four stars by Golf Digest, is the crown jewel of the park. I’ve never been much of a golfer, but I had a great time wandering around the park’s trails and enjoying the peaceful silence. That’s the thing about even the best parks in Ohio — they’re rarely very crowded, giving you all the time you need to get that R&R with nature. Salt Fork is only about a 15-minute drive from downtown Cambridge. 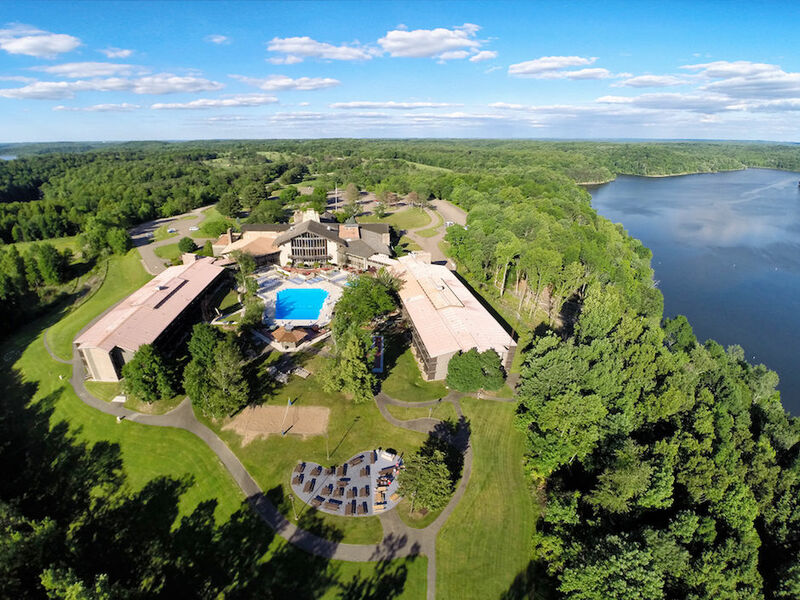 It has a huge inland beach (there’s nearly 3,000 acres of water), 14 miles of hiking trails, a mini-golf course, 200+ campsites, and the Salt Fork Lodge, which itself has 53 cabins and 148 rooms (and yes, it’s overlooking the lake at just the right point). It’s way too easy to forget time here — at least for a weekend. 9. The big city is never far away. Cambridge is located close to the middle of the Cleveland, Columbus, and Pittsburgh I-70 corridor, making it a perfect weekend getaway. If you live within striking distance, you can drive in after work on Friday, feast at the Bear’s Den, and then head to your yurt, drinking wine and toasting the passing rhinos.